Also known as Tokyo International Airport, Tokyo Haneda Airport is one of two major airports serving the Japanese capital and is a major hub for domestic flights. Our guide to the airport includes contact details, as well as information regarding terminal facilities, nearby accommodation options and directions to/from Tokyo city centre. There are information desks in each terminal. Information telephones are located at various points within the terminals and operate 24 hours a day. Tourist information is available from a kiosk on the second level of the International Terminal. A free shuttle bus operates between the International Terminal and domestic terminals every six minutes from 0500 to 0000. Transfers between the domestic Terminals 1 and 2 are via a moving walkway. Bus: Numerous scheduled bus routes link the airport with many destinations in and around Tokyo, including the Haneda Airport Express bus (tel: +81 3 5789 8686; www.haneda-tokyo-access.com) from the International Terminal. The fare to central Tokyo locations is around ¥1,000 – tickets must be purchased before boarding from the desk in Arrivals, with bus stops immediately outside the terminal. Taxi: Taxis are readily available outside the terminal buildings. Taxis operate on a set fare basis, with costs to the centre of Tokyo ranging from ¥6,000 to ¥8,000. The journey time to central locations is 25 to 40 minutes, depending on traffic. There is a wide choice of cafés, bars and restaurants offering both Japanese and international cuisine. There is a particularly large selection of eateries on the fourth level of the International Terminal, ranging from small sushi bars to a French bistro. Duty-free shopping is available for international passengers in the departure area of the International Terminal. Gift shops offer a range of local and international items, souvenirs and branded gifts, and there are also outlets selling convenience goods. Luggage lockers are available, as is porter assistance and a luggage delivery service. A lost luggage service operates from a desk on the ground floor of Terminal 1. For items lost or found in the International Terminal, contact the terminal information line (tel: +81 3 6428 0888). Baby changing facilities are available throughout the airport. There are first aid stations in Terminal 1 and the International Terminal. A hairdresser’s and a dental clinic can be found in Terminal 1. There is a choice of airport lounges with business facilities, one of which is open 24 hours a day in the International Terminal and offers several small meeting rooms (tel: +81 3 6428 0677). Meeting space is also available in Terminal 1. A wider choice of business services and conference space can be found in some of the hotels in and around the airport. Tokyo Haneda Airport offers a range of facilities for the disabled, including in-terminal transportation, hearing loops and designated parking spaces. The terminals are fully accessible to wheelchair users, who can request wheelchair hire at the information desks (tel: +81 3 6428 0888). Short and long-term parking is available at all three terminals – shuttle buses provide links to the car parks. Full details are available on the airport website or from the airport parking offices (tel: +81 3 5757 8191 or +81 3 5757 9498 for Terminal 1, +81 3 6428 9498 for Terminal 2, or +81 3 6428 0121 for the International Terminal). 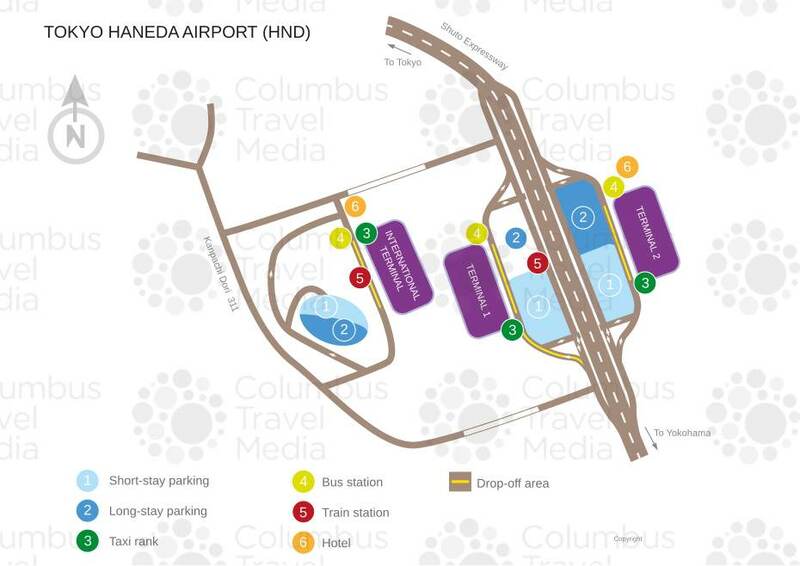 Nippon, Nissan, Orix, Times Car Rental and Toyota are among car rental agencies operating at the airport. Desks for these car hire companies are situated in the arrivals areas of all three terminals.